A neighbor called us early Friday morning to inform us two of our cows were on the road. Grrrrr. The animals are currently on a neighboring parcel (we call it "the pond property") which has grazing, shade, and a nice pond. How did the cows get out? And why? The two loose beasties led us on a merry chase at a time of the morning we really didn't want to go on merry chases, but we finally got them back where they belonged. However it was time to check and make sure the pond property fences were okay. So I took tools and wire and set off. All looked peaceful. I tightened up bit and pieces of fencing as I saw the need. As I walked, the cows started slowly following in my wake, as cows are wont to do. I found the remains of a magpie. Everywhere I went, I gathered an entourage of curious cows. They weren't in any hurry, they were just moseying along, curious what I was doing. Mosey mosey mosey. Everything was fine until I came to a 20-foot section of fencing that was just down. On the ground. Totally open. 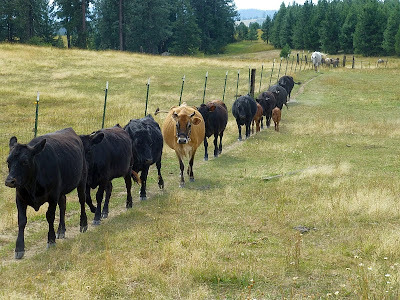 And without any thought, six cows just moseyed across the fence line onto a neighboring piece of property. Nothing I could do to stop them. The only thing I could do was keep the rest of the animals from following. Instantly I turned away, passed the remainder of the herd, and called "Bossy bossy bossy bossy BOSSY!!" Thankfully the remainder obediently turned and followed me off the pond property and back into our eaten-down pasture. I shut the gate and locked our animals in. Another neighbor is leasing the pond property along with us for his horses. Since they don't respond to the "Bossy" call, nor were they on the side with the downed fence, I left them on the pond property side of the fence. 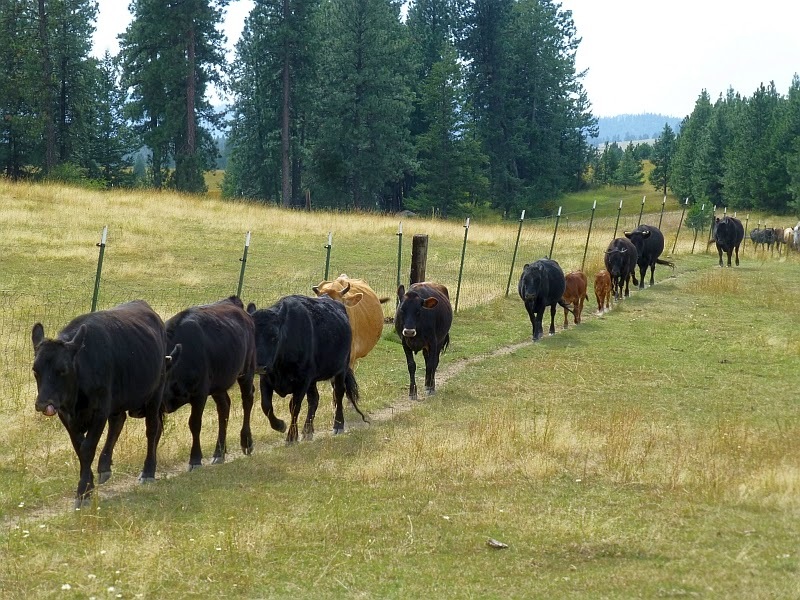 Now we needed to get our six recalcitrant cattle off the adjacent parcel of land. I went back up to the house, gathered Don and Younger Daughter (Older Daughter was at work), and they hopped in the truck and drove 3/4 of a mile to where the adjacent property has an unfenced portion that meets the road (which is doubtless where the two cows got out early in the morning). Meanwhile I gathered some baling twine and walked back down to the pond property to where the fencing was down. In other words, Don and Younger Daughter came the back way, I came in the front way. Sure enough, the beasties were calmly grazing. This parcel is owned by absentee owners and has never been maintained. It was horribly overgrown with St. John's wort and useless as pastureland. It was just the novelty of a new location that attracted the cows. With Don and Younger Daughter slowly herding from behind with push poles, I walked in front toward the fence break, calling "Bossy bossy bossy bossy BOSSY!!" as I went. Thankfully the animals -- unimpressed by the quality of forage on this new parcel -- followed behind. Within minutes, they were back on the right side of the fence. Hard to see, but this is the two sections of fencing that was on the ground. The fence had been cut some time before, doubtless by hunters wanting access between the two properties. It was our fault for not walking the fence lines before releasing the cattle onto the pond property. Because we didn't have any proper fencing tools (come-along or wire) with us, we cobbled the section back to the pole with baling twine. God bless baling twine, the universal fix-it remedy on every farm. This patch is actually stronger than it looks and could conceivably last more than a year. However we'll come down and fix it properly when we have time. Mission accomplished, Don walked back across the adjacent land to fetch the truck, and Younger Daughter and I completed walking the fence line perimeter (just to check that nothing else was amiss) before opening the pasture gate and heading up to the house. Chatting as we walked, I paid no attention to what was going on behind us. But all of a sudden Younger Daughter said, "Look behind." Once again I was gathering the entire herd in my wake, like an entourage. Herd mentality! So now the beasties are where they're supposed to be. Life is never dull around here. Had to chuckle at your cow stories! They can be such curious animals. Years ago, two friends and myself were squirrel hunting in a wooded pasture. A small herd of young cows were free to roam the woods. One friend was what you would call a "city boy" not used to cows. As we were looking for squirrels, the "city" friend needed to go back to the truck for something. The two of us kept looking for "tree rats" and after a while, noticed our other friend was gone too long. Going back to check on him, we found him backed up to the tailgate of the truck with the whole herd of cows surrounding him and sniffing him. He was a bit shaken and didn't realize all he had to do was flap his arms and yell and they would have left him alone. We had a good laugh at that one! What a funny crew of critters! I think that most everything can be fixed with baling twine and duct tape. Herd mentality...hmm. Hate to break this to you Patrice, but I fear you bovines are Democrats. It might be a valuable botanical herb, but it's a durned nuisance as a pasture plant. It's stiff and nasty, and when it's dried in a bale it's like chewing wire for the cows. Totally inedible. Nope. You'll have to cut the horn. Be careful when you do because it will bleed. A cut horn also has a sinus that leads directly into the cow's skull, so you'll have to control for flies lest she get maggots. It's gruesome but it will need to get done. Don't try to remove the whole horn; just remove the bottom few inches (the more horn you remove, the bigger the hole into her head). The horn will continue to grow even after cutting, so you'll either have to re-cut again at a future date, or eventually put the animal in the freezer. That is funny. I remember when my calf got out and she followed by to the pasture but would not go into the pasture, she dislike her roommates two steers. :) It is surprising how loyal they are if you do not abuse them. I just read that they can tell the difference between the abuser and the friendly. I hate fence wreckers, I guilty too, to much work to fix the fence. Something you have to do anyway. The Peaceful Kingdom sometimes puts you through your paces, don't they? Years ago, one of my front tires blew out on a country road. I managed to steer into the ditch safely. I got out of the car, and began assessing my next move - this was before everyone had cell phones. I got busy with the problem at hand, with my back to a cow pasture. After about 10 minutes, I turned around and there were about 15 cows all jockeying for position along the fence watching me. They were rib-to-rib, pushing against each other as if to say, "What's she doing? Move over, I can't see. I was here first! Get out of my way." I doubled over in laughter. Wished I'd had a camera. NO Patrice it's not your fault for not walking the fence lines its the bozo who cut the fence,s fault , OH just once I would like to follow a fence cutting bozo home AND SAW THE HINGES OFF HIS FRONT DOOR ! . see how they like it !